The new addition World of Warcraft: Legion players learn about what happens after the events described in Warlords of Draenor. Fel Fire breaks out with a bang: the warlock Gul´dan, who gave sworn orcs and the Burning Legion, he opened the gates for an invasion of demons to Azeroth. With the threat of such force is not encountered before either the Alliance or the Horde. 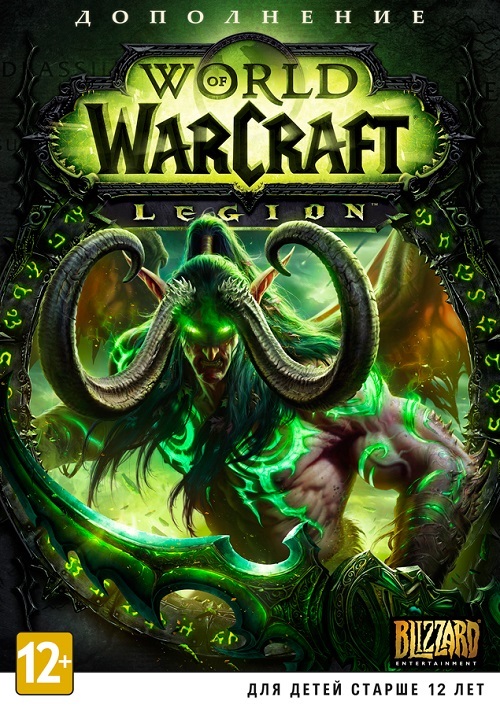 In order to save your world from destruction, the heroes have to uncover the secrets of the legendary Shattered Isles, get an amazing artifact weapons and sign a secret contract with demon hunter Illidari - vengeful followers of Illidan Stormrage. World of Warcraft: Legion of Azeroth´s heroes turn into a formidable force of retribution, facing the demons. - New class: Demon Hunter. Release the inner demon, playing for a whole new hero class melee, has incredible mobility and the ability to transform into a demonic form. - New feature: artifact weapon. Apply Legion hit by a tremendous weapon, sung in legends. Discover new power artifact and change its properties to create a weapon that you need. - A New Continent: Chopped island. Find out what happened to the lost civilization of the night elves, pierce the unnatural Emerald Nightmare and fight the minions of the Legion in completely new areas. - Instant raise to 100. Increase the level of your character up to 100, to prepare for a meeting with the Legion, and his friends enter their names in the latest chapter in the epic history of World of Warcraft. - New features: Hold class. Gather together the representatives of its class and legendary member of your order, which number includes the most famous heroes of the Warcraft universe, and to submit his colleagues on important tasks. - Sign in to your account (https://eu.battle.net/account/) (login and password). - After activating the key, you can redownload the game. Спасибо, ключ пришёл активировал играю! Всё отлично и быстро пришло. Хочу подарок. Отличный продавец! Код пришёл сразу и активизировался без проблем! Хочу подарок! Спасибо! ключ пришел сразу, все норм активировалось.ЖДУ ПОДАРКА!! Отлично, ключ рабочий можно играть!!! УУУухххухууу!